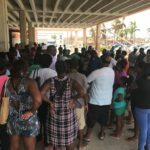 The Valley, Anguilla (September 13th 2017):- Almost 200 Nationals of St.Kitts-Nevis turned out after hours notice to meet with Prime Minister Dr. Hon Timothy Harris and a small delegation which included Hon. Ian Patches Liburd and the Governor of the Eastern Caribbean Central Bank Timothy Antoine. The nationals could not contain their joy after hearing from the Prime Minister Harris. 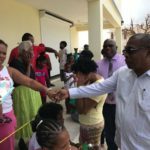 Some wept openly when they saw the love and compassion demonstrated by PM Harris and Hon Liburd as well as the Governor of the ECCB who used the opportunity to verify the needs of the Nationals before considering and making provision for financial help. “PM Harris showed us compassion and attention. And sometimes that’s all that is needed. 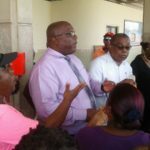 However he listened to our concerns and issues and I feel assured that the St.Kitts government will do all that they can for our nationals down here,” said a national who has been living in Anguilla for over 25 years. PM Harris was in Anguilla attending the OECS Council of Ministers meeting of the ECCB. He met with the nationals at the airport as soon as he and his delegation arrived. Hon. Mark Brantley will be leading a more substantive meeting on Thursday at 10am. The main purpose of the visit is to assess the needs of SKN Nationals in Anguilla. Similar visits are planned for St.Maarten on Thursday afternoon with a meeting at the Cole Bay Bakery at 2am . Hon. 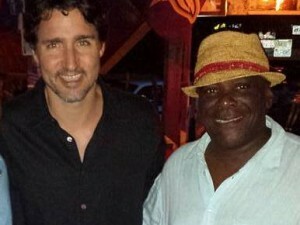 Shawn Richards Deputy Prime Minister is currently in the BVI and is expected to lead similar interactions with SKN Nationals there on Thursday September 14th as well.